If businesses or entrepreneurs want to learn how to publish a podcast, the Digital Marketing Labs has released a Special Report to help. Today, millions of people worldwide subscribe to and download podcasts. Thousands of entrepreneurs looking to connect with the undisputed king of digital content are learning how to publish a podcast and position themselves within the world’s most valuable brand. Apple and iTunes’ demanding share of the digital and mobile markets should compel anyone to take advantage of every beneficial opportunity granted. 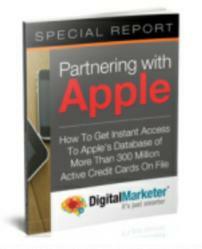 The “Partnering with Apple” Special Report explains the incomparable benefits that serialized, low-cost content can provide an individual or business. It’s a two-pronged effect: First, the exposure of a song, e-book, or podcast for 99-cents or less gives consumers a chance to sample content without a large-summed product or service. If the quality of the content is good, which is a given with the Special Report, then consumer loyalty gets translated into higher-priced products over time. Take a look at this now “historic” BBC News article from 2005, less than a year into podcasting’s existence. In it, the podcasting pioneer Adam Curry explains the ease of getting published, which has only become more efficient with time. “In its bare essence,” said Curry, “it's broadcasting to mp3 players. What's great about it is that anybody can do it. All you need is a way to record your voice or whatever sounds you want to, a computer and an internet connection." Even back then, tech gurus were focusing on podcasting’s real potential for phenomenal success and popularity. Today, millions of people worldwide subscribe to and download podcasts. Profitability online and with Apple depends on the quality of content, and “Partnering with Apple” makes sure that anything created based on its knowledge and information will be worthy of customer interest. Learning how to publish a podcast using “Partnering with Apple” earns an individual or business credibility beyond the written word. Sure, a website can be fancy and full of information, but podcasting’s ability to give creators a voice, a face, and a distinct Internet personality can change them into a recognizable expert. The Digital Marketing Labs publishes Special Reports, informational articles, and other educational materials to help entrepreneurs and business owners develop winning strategies for effectively marketing their brands and expertise. The newest article advises using “Partnering with Apple” to find out how to publish a podcast, and tap into the biggest directory of digital content there is.